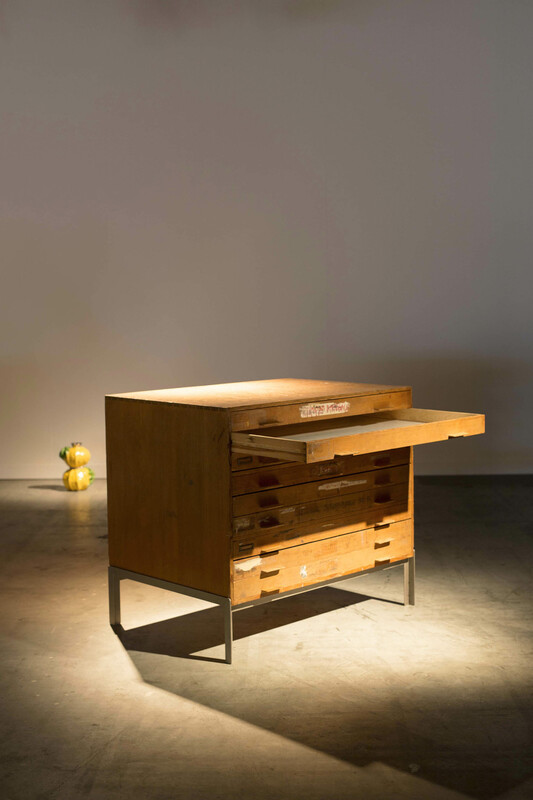 Made of Oregon pine and ready-made steel angels, the cabinets were part of a commission that included desks for professors and students, and which proved critical for Kjærholm’s professional and stylistic development. It capped a period of struggle during which many of his designs—most of which were attempts to create a novel chair—failed to make it past the prototype phase, and it led to the production of his first commercial hits in 1956—the PK 22 lounge chair and the PK 61 low table. In the desks and cabinets’ marriage of wood and steel, Kjærholm first refined his typical approach to materials: emphasizing their particular qualities through simple forms, and combining industrial production with fine craftsmanship. A young architect designing furniture for student architects, Kjærholm had an intimate relationship to the future users of his cabinets (all the more since he started teaching part-time at the Academy in 1955). His work was also their work, and when they used the cabinets as tools in the creation of their own designs, they exerted the same kind of labor upon them as he had invested into making them. 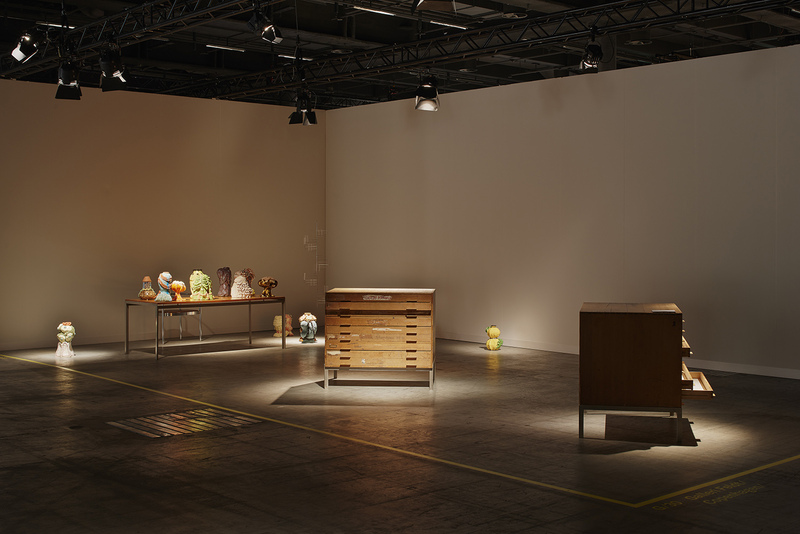 The mirroring of the designer in the users renders the many physical traces left by Academy students on Galleri Feldt’s cabinets particularly poignant. In a way, they speak for Kjærholm, but in their careless—at times aggressive—use of his sleek design, they also disregard him. With a utilitarian nonchalance, the students have left behind a complex patina composed of names carved or written on drawers; stickers and labels pasted on and peeled off; paint both accidentally splashed and purposefully brushed; and deep cuts grooved into the cabinet tops by knives that slashed countless pieces of cardboard. 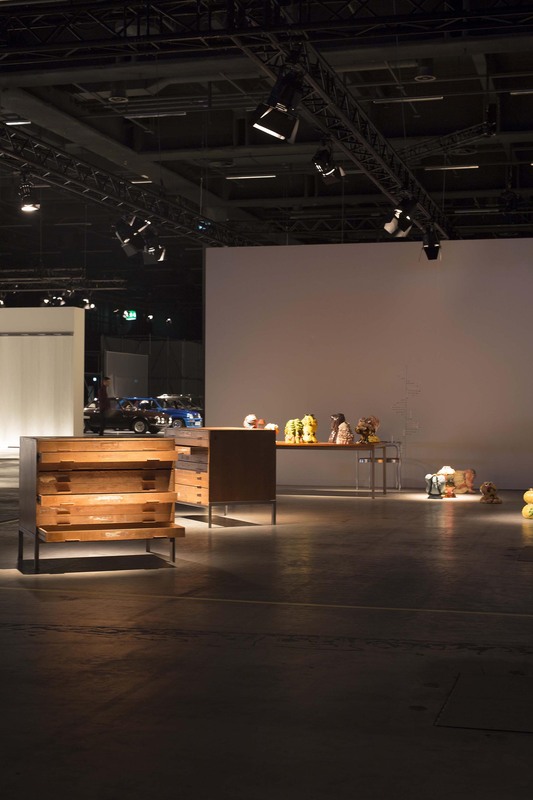 The students have thus transformed the cabinets from design objects into unique historical artifacts—registers of manual gestures that go unnoticed in the quotidian flow of architectural work, but whose indexical marks have accumulated in the cabinets’ bodies through decades of repetition by different individuals. Danh Vo, himself a former Academy student, inserted into the cabinets his own example of creative labor: sheets of paper, each sized to a drawer, on which his father, Phung Vo, drew the phrase, “All work and all play makes Jack a dull boy” in large outlined blackletter script. This script has been used repeatedly in many of Danh and Phung’s collaborations, and as in past examples, there is a dissonance, both aesthetic and historic, between the style of the writing and its content. There is also a dissonance between Phung’s drawings—produced with meticulous uniformity by a single, known hand—and the randomly wrought array of marks produced by anonymous students whose diverse works had been housed in the cabinets through the years. 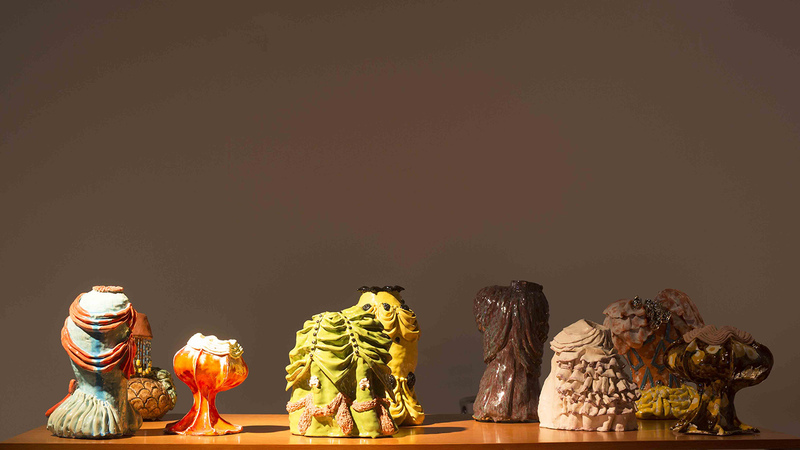 In a sense, though, Phung himself takes on the role of a student, and his drawings, speaking for the vexations and frustrations that the cabinets must have “witnessed” over the years, make manifest the dark side of creative labor. In conjuring the dark side of labor, Danh took inspiration from Stanley Kubrik’s The Shining (1980), specifically from Jack Torrance’s typing, “All work and no play makes Jack a dull boy” over and over again as he loses his mind while trying to write a book in the isolated Overlook Hotel. When Jack’s wife, Wendy, discovers that the stack of papers that was supposed to comprise his literary work, we see that each page has different formatting, with the proverb masquerading at times as prose or poetry. As with Phung’s drawings, there is a dissonance here between style and content: even though Jack doesn’t anything of substance, he makes a visual creation of sorts, playing with patterns through spacing, line breaks, indentations, etc. The irony here is that in literary terms, Jack does not work at all, so his blaming overwork for his madness is a bit rich. In somatic and cognitive terms, however, he works very hard: typing hundreds of pages is physically taxing, and finding new ways to refashion the same thing is a challenge inherent to all creative work. It’s certainly true for Kjærholm, and many other modernist designers who wanted to reinvent the chair; it’s true for Danh Vo, who re-contextualized and re-stylized the by-now clichéd Kubrick reference; and it’s also true for Kubrick, who put his own stamp on a centuries-old proverb that many today credit him with inventing.